Safety at work stations - an issue which is coming to the fore. 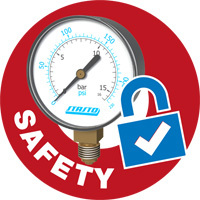 Our safety program offers the best conditions for a positive evaluation of your air working station to the latest state of safety technology. STASTO pays attention to be gently to the environment and the nature. This is the start of an environmental offense. The series green line has been specifically designed as an energy-efficient solenoid valve series. Therefore direct acting standard valves of STASTO/Müller co-ax are coupled with a completely newly developed, patented control electronics. With the new SPEEDLINE series STASTO offers a compressed air line system, where the installation is a child's play. STASTO offers a new, wider range of butterfly valves. Now technical requirements can be fulfilled, which were not possible earlier. Choose from over 20,000 products. the awareness about the effects of regional networking.